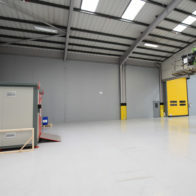 Westgate have seen a steady increase in the demand to install warehouse and factory partitions that satisfy businesses (and their insurance company’s) requirements for fire rating. In a home office report detailing fire and rescue incident statistics, it was reported that in England, there were over 12,000 fires attended to non- residential buildings between April 2017 and 2018. Businesses can suffer tragic internal losses in the event of a fire and employers can find themselves at risk of serious penalties, sometimes as severe as a prison sentence, for not adhering to UK fire safety regulations. Therefore it is vitally important for businesses to consider to remove or reduce the risk of fire in the workplace. 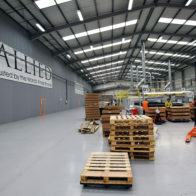 Due to working with Westgate in the past and understanding the benefits of our Flexiwall partition, Allied Glass (an independently owned premium glass bottle manufacturer which designs, develops and manufactures luxury glass packaging) approached us to create a temperature controlled environment, which would be suitable for the necessary curing involved in their production processes. The partition was also required to act as a fire break between production and storage within their factory. Flexiwall can be manufactured in a range of silcloth material dependant on the client and project needs. In this instance, Allied Glass’ temperature control and fire rated requirements were achieved by designing and manufacturing Flexiwall in a woven ‘E’ glass fabric material coated with aluminium polyurethane rubber (25gms on each side). Due to the materials thermal properties, it also provided the required insulation properties that would enable the newly separated area to operate at a different temperature. 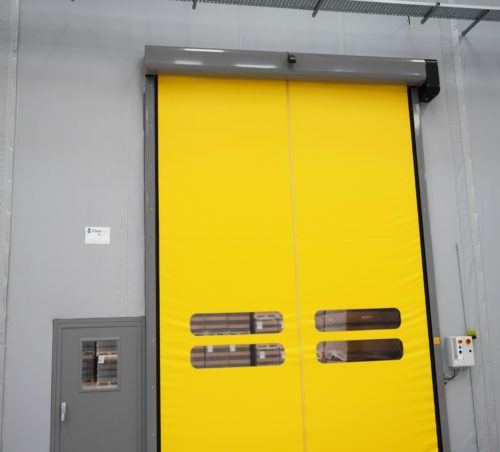 The completed Flexiwall partition was 130m long x 10m high and included three fast action doors and two steel pedestrian doors for access. Flexiwall is quicker and cleaner to install than traditional partitioning methods and can even be reconfigured, removed or relocated should business needs evolve. Flexiwall can be easily designed to fit any size and shape of building and easily installs around existing ducts and pipework, with the final installation taking up only millimeters of floorspace. As with the Allied Glass installation, Flexiwall can also be designed in a number of colours and corporate logos and branding can be added.